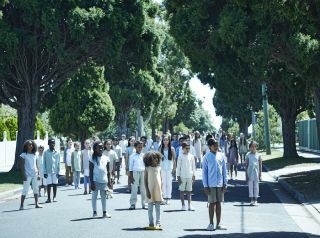 A chilling image from the TV miniseries based on Arthur C. Clarke's science fiction classic "Childhood's End," which debuts tonight (Dec. 14) on the Syfy network. Arthur C. Clarke's science fiction classic "Childhood's End" has been reimagined for the 21st century, and brought to the small screen, in a new TV miniseries debuting on Syfy network tonight (Dec. 14). When a fleet of spaceships appears in the sky above Earth's largest cities, the alien beings onboard insist that they have arrived to help the human race. The visitors slowly begin to eliminate war, disease and poverty — but what will be the cost of building heaven on Earth? The show offers a modern retelling of the 1953 novel by Clarke. You can check out the trailer for "Childhood's End" here on Space.com. The show stars Charles Dance, best known for playing Tywin Lannister on the HBO show "Game of Thrones," as one of the alien overlords, Karellen. Colm Meany, who played Chief O'Brien on "Star Trek: Deep Space Nine," plays Hugo Wainwright Jr., a newspaper owner who dubs the aliens "the Overlords," and is skeptical of their motives. Mike Vogel, who starred in the TV adaptation of "Under the Dome," stars as Ricky Stormgren, who is chosen to be an intermediary between humans and the Overlords. The series was directed by Nick Hurran, who has directed episodes of "Sherlock" and the modern reboot of "Doctor Who." One of the most tantalizing aspects of the show, which is carried over from Clarke's novel, is that the Overlords speak to humans through avatars and from behind walls, but will not show the humans what they look like — a move that invokes mistrust in many people. It is not until long after they arrive on Earth that the Overlords decide to reveal themselves — but is humanity ready to see them? Clarke is known for his masterful blending of science and fiction, but "Childhood's End" ultimately wrestles with a very old philosophical question. Fans of science fiction should stay tuned when "Childhood's End" is over — at 10 p.m. EST/PST, Syfy will air the first episode of the new show "The Expanse," which is based on the popular book series by James A. Corey (the pen name for writing partners Daniel Abraham and Ty Franck). In a special two-night event, the second episode will also air after "Childhood's End" on Tuesday. The rest of the 10-episode series will air on Monday nights. The first episode is also available to watch online, via Syfy on demand, Amazon, YouTube and other online video providers. Syfy network has been ramping up its space-related programming of late. Earlier this year, the network debuted two action-packed, space-based series: "Dark Matter" and "Killjoys," both of which have been renewed for second seasons that will begin airing in 2016. In 2014, the network announced it would be adapting another of Clarke's novels: "3001: The Final Odyssey." First published in 1997, the book is the final installment in the "Odyssey" series, which began with "2001: A Space Odyssey." The network reported that Ridley Scott — director of classic science fiction films including "Alien," "Blade Runner" and, more recently, "The Martian" — is signed on as an executive producer.